Happy book birthday, Alternative Alamat! Ever since I started my book blog, I’ve made it a point to read and review local stuff. You know, books written by Filipinos (or even half-Filipinos) even if they are not necessarily set here. I mean, I read so much of the foreign stuff, so it’s just right that I should also read (and write about) things from my homeland. It’s not just about loving your own, but also because I think we have a lot of good stuff out there but people just need to know about it. Philippine mythology is full of images that ignite the imagination: gods of calamity and baldness, of cosmic time and lost things; the many-layered Skyworld, and weapons that fight their own battles; a ship that is pulled to paradise by a chain, and a giant crab that controls the tides… yet too few of these tales are known and read today. “Alternative Alamat” gathers eleven stories, by contemporary authors of Philippine fantasy, which make innovative use of elements of Philippine mythology. None of these stories are straight re-tellings of the old tales: they build on those stories, or question underlying assumptions; use ancient names as catalysts, or play within the spaces where the myths are silent. What you will find in common in these eleven stories is a love for the myths, epics, and legends which reflect us, contain us, call to us–and it is our hope that, in reading our stories, you may catch a glimpse, and develop a hunger, for those venerable tales. 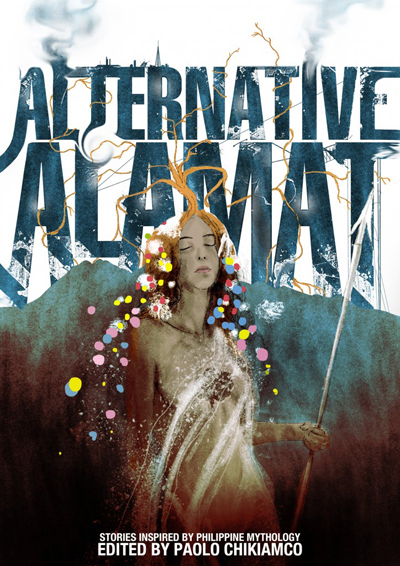 “Alternative Alamat” also features a cover and interior illustrations by Mervin Malonzo, a short list of notable Philippine deities, and in-depth interviews with Professors Herminia Meñez Coben and Fernando N. Zialcita. The digital edition of “Alternative Alamat”, co-published by Flipside Digital Content, may now be purchased for US$4.99 at the Amazon.com Kindle store and for PHP235.00 at Flipreads.com, and will soon be available at the Apple iTunes and Barnes & Noble Nook stores. Oooh! I want to read this! Also that cover is AWESOME. Is there a hard copy of this book? If so, is it available in the National Bookstore? Hi! No print copy available as of now, but we hope there would be one out sometime.